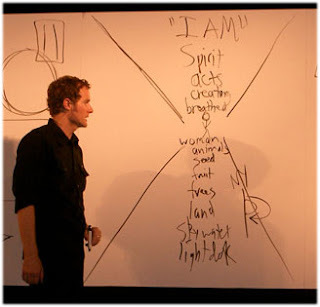 Since I was unable to go and see it in person, I recently acquired the Everything is Spiritual DVD, from Rob Bell's Everything is Spiritual Tour. It took a while after I actually watched it for it to sink in and for me to see how truly genius this... sermon..., or class..., or whatever, was. The dialog is great because it's not truly a sermon like what Rob would normally do, it's not focussed on just teaching exegesis of the Bible. It's actually a presentation of why it could make sense to be a Christian without all the "apologetics" and the evidential arguments which we often hear. In a culture that no longer accepts that there is a way to see the world which is truly objective, Rob is inviting people to see the world in a certain way, through a certain lens. I think anyone could watch this video (especially intellectuals). This is not to be seen as a model, necessarily, and I'm sure it would be wrong to come up with some formula for evangelism from watching this video. But, with good observation, one could learn a lot from what Rob Bell is doing here.